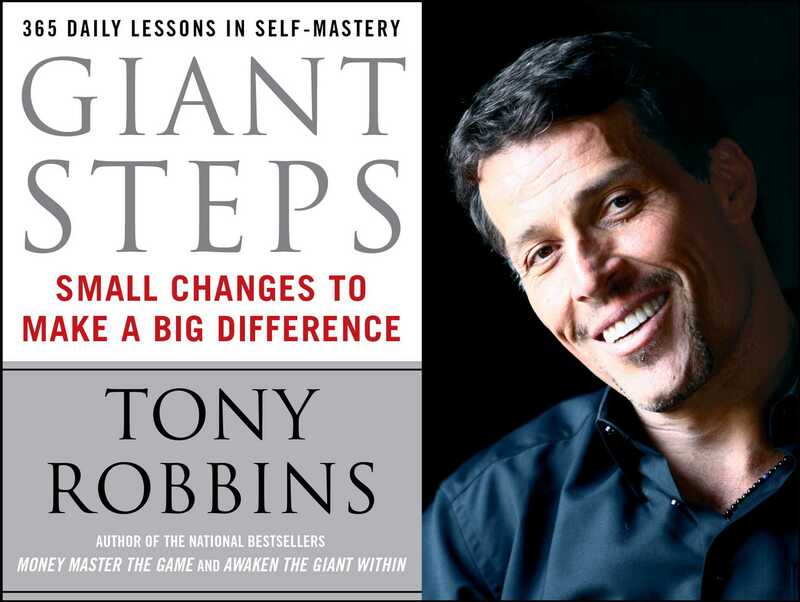 Based on the finest tools, techniques, principles, and strategies offered in Awaken the Giant Within, best-selling author and peak performance consultant Anthony Robbins offers daily inspirations and small actions -- exercises -- that will compel you to take giant steps forward in the quality of your life. We all have dreams.... We all want to believe deep down in our souls that we have a special gift, that we can make a difference, that we can touch others in a special way, and that we can make the world a better place. What's one of your aspirations? Maybe it's a dream you've forgotten or have begun to relinquish. If that vision were alive today, what would your life be like? Take a moment now just to dream and to think about what you really want for your life. It's not what we do once in a while that counts, but our consistent actions. And what is the father of all action? What ultimately determines who we become and where we go in life? The answer is our decisions. It's in these moments that our destiny is shaped. More than anything else, I believe our decisions -- not the conditions of our lives -- determine our destiny. Who would have thought that the conviction of a quiet, unassuming man -- a lawyer by trade and a pacifist by principle -- would have the power to topple a vast empire? Yet Mahatma Gandhi's decision, his belief in nonviolence as a means to helping India's people regain control of their country, set in motion an unexpected chain of events. Realize the power of a single decision acted upon immediately and with utter conviction. The secret is to make a public commitment, one so forceful you cannot turn back from it. While many thought that his was an impossible dream, Gandhi's consistent commitment to his decision made it an undeniable reality. What could you, too, accomplish if you invoked a similar level of passion, conviction, and action to create unstoppable momentum? Each of us is endowed with innate resources that enable us to achieve all we've ever dreamed of -- and more. The floodgates can be opened by one decision, bringing us joy or sorrow, prosperity or poverty, companionship or solitude, long life or early death. I challenge you to make a decision today that can immediately change or improve the quality of your life. Do something you've been putting off...master a new set of skills...treat people with newfound respect and compassion...call someone you haven't spoken to in years. Just know that all decisions have consequences. Even making no decision at all is a decision in its own way. What decisions have you made or failed to make in the past that powerfully influence your life today? In 1955, Rosa Parks made a decision to defy an unjust law that discriminated against her on the basis of her race. Her refusal to give up her seat on the bus had consequences far beyond those she may have been aware of at the moment. Had she intended to change the structure of a society? No matter what her intent, her commitment to a higher standard compelled her to act. What far-reaching effects could be set in motion by raising the standards you hold for your life and making a true decision to live up to them today? We've all heard about people who've exploded beyond the limitations of their conditions to become examples of the unlimited power of the human spirit. If there's anything you're not happy about -- in your relationships, in your health, in your career -- make a decision right now about how you're going to change it immediately. The more decisions you make, the better you'll become at making them. Muscles get stronger with use, and so it is with your decision making muscles. Today, make two decisions you've been putting off: one easy decision and one that's a bit more far-reaching. Immediately take the first action toward fulfilling each of them -- and follow through with the next step tomorrow. By doing this, you'll be building the muscle that can change your entire life. We must commit to learning from our mistakes instead of agonizing over them, or we're destined to repeat our errors in the future. When you temporarily run aground, remember that there are no failures in life. There are only results. Consider the adage: Success is the result of good judgment, good judgment is the result of experience, and experience is often the result of bad judgment! What have you learned from a past mistake that you can use to improve your life today? Success and failure are usually not the result of a single event. Failure is the result of neglecting to make the call...to go the extra mile...to say, "I love you." In the same way that failure follows this string of small decisions, success comes from taking the initiative and following up...persisting...eloquently expressing the depth of your love. Research has consistently shown that those who succeed tend to make decisions rapidly and are slow to reverse a well-thought-out position. Conversely, people who fail usually decide slowly and change their minds frequently. Once you've made a sound decision, stick by it! He's spent nearly half his life in an iron lung and the other half in a wheelchair. With so many personal challenges, surely he's been in no position to improve the quality of life for others. Or has he? Ed Roberts personifies the power of a single, committed moment of decision. He became the first quadriplegic to graduate from the University of California, Berkeley, and served as director of the California State Department of Rehabilitation. A tireless advocate for disabled people, he has lobbied to secure all persons' right of access and supplied many of the innovations that made these laws enforceable. There are no excuses. Make three decisions now that will change your health, your career, your relationships, your life -- and act upon them. How do you turn the invisible into the visible? The first step is to define your dream precisely; the only limit to what you can achieve is the extent of your ability to define with precision that which you desire. Let's begin now to crystallize your dreams, and over the next few days form a plan that will ensure their attainment. We all have goals, whether we know it or not. No matter what they are, they have a profound effect on our lives. Yet some of our goals, such as "I need to pay my lousy bills," lack any inspiration. The secret of unleashing your true power is setting goals that are exciting enough that they truly inspire your creativity and ignite your passion. Right now, consciously choose your goals. Brainstorm everything worth pursuing. Then pick a goal that excites you the most, something that will get you up early and keep you up late. Assign a deadline for achieving it, and write a paragraph describing why you absolutely must attain it by then. Is it grand enough to challenge you? to push you beyond your limits? to uncover your true potential? Have you ever bought a new outfit or car, then started spotting it everywhere? Surely it's always been around you. Why haven't you noticed it until now? Quite simply, a portion of your brain is responsible for screening out all information except what's essential to your survival and success. So much that could help you achieve your dreams is never noticed or utilized simply because you haven't defined (taught your brain what's important!) your goals with clarity. Once you do, however, you'll have triggered your Reticular Activating System (RAS). This part of your mind becomes like a magnet, attracting any information or opportunities that can help you achieve your goals more rapidly. Tripping this powerful neurological switch can literally transform your life in a matter of days or weeks. 2) As you work on the goal-setting exercises, constantly ask yourself, "What would I want for my life if I knew I could have it any way I wanted it? What would I do if I knew I could not fail?" Your sense of personal well-being and enrichment lays the foundation for every other achievement in your life. 1) Take five minutes to brainstorm all the possibilities: What would you like to learn? What skills do you want to master? What character traits would you like to develop? Who would your friends be? Who would you be? 2) Give each of your goals a timeline (6 months, 1 year, 5 years, 10 years, 20 years) for completion. 3) Highlight your top one-year goal. 4) In two minutes, write a brief paragraph stating why you are absolutely committed to achieving this goal within the next year. Whether you aspire to being at the top of your profession amassing millions or a professional student gaining a wealth of knowledge, now is your chance to be sure it counts. 1) Take five minutes to brainstorm all the possibilities: How much money do you want to accumulate? What do you wish to achieve with your career/company? How much do you wish to earn annually? What financial decisions do you need to make? If you had no financial limitations, what are some of the things you'd like to have or experience? If a genie were before you now, waiting to obey your every command, what would you wish for? 1) Take five minutes to brainstorm all the possibilities: What would you like to build or purchase? What events would you like to attend? What adventures would you like to experience? This is your opportunity to leave your mark, to create a legacy that makes a true difference in people's lives. 1) Take five minutes to brainstorm all the possibilities: How can you contribute? Who or what can you help? What can you create? Never leave the site of a goal without first taking some form of positive action toward its attainment. Right now, take a moment to define the first steps you must take to achieve your goal. What can you do today to move yourself forward? Even the smallest step -- a phone call, a commitment, sketching out an initial plan -- will put you closer to your goal. Then develop a list of simple things you can do every day for the next ten days. These ten days of creating a chain of habits and building unstoppable momentum will ensure your long-term success.Begin now! How would you feel if you had mastered and attained all your goals a year from now? How would you feel about yourself? How would you feel about your life? Answering these questions will help you develop compelling reasons to achieve your goals. Having a powerful enough why will provide you with the necessary how. Take this opportunity to brainstorm your top four one-year goals. Under each one, write a paragraph about why you are absolutely committed to achieving these goals within the year. The secret to achieving your goals is mental conditioning. Review them at least twice daily. Post your goals where you're sure to see them every day: in your journal, on your desk, in your wallet, or over your bathroom mirror so you can look at them while you're shaving or putting on makeup. Remember, whatever you consistently think about and focus upon, you move toward. This is a simple yet important way to program your RAS for success. If your first attempt at achieving your goals seems futile, should you move on and do something else? Absolutely not! Persistence overshadows even talent as the most valuable resource in shaping the quality of life. After all, no one ever achieved a goal by being interested in its achievement; one must be committed. Isn't it possible that short-term "failures" may actually provide you with the necessary insights or distinctions to create even greater success in the future? Of course! As you look back now over your "unsuccessful" attempts in the past, what have you learned? How can you use these insights to create great success, now and in the future? All people who succeed consciously or unconsciously utilize the same formula for success. Use these four simple steps to achieve whatever you desire. 2) Take action (because desire is not enough). In pursuit of our goals, we often set in motion far-reaching consequences. Does the honeybee deliberate on how to propagate flowers? No, but in the process of seeking sweet nectar, the bee unknowingly gathers pollen on its legs, flies to the next flower, and sets in motion a wondrous chain reaction that results in a hillside awash in color. In the same way, your pursuit of worthwhile goals has probably resulted in unforeseen benefits for others. Maybe it was the simple decision to call an old friend once a month, which has resulted in all sorts of pluses you didn't even anticipate. In how many ways will other people benefit from your efforts today? The real purpose of a goal is what it makes of you as a human being while you pursue it. Who you become as a person is the ultimate reward. Take a moment now to write a brief paragraph describing all the character traits, skills, abilities, attitudes, and beliefs you need to develop to achieve all of your goals. Don't put off joy and happiness. To so many people, goal setting means that only someday, after they've achieved something great, will they be able to enjoy life. There's a huge difference between achieving to be happy and happily achieving. Strive to live each day to its fullest, squeezing all the joy you can out of each moment. Instead of measuring your life's value by your progress toward a single goal, remember that the direction you're headed in is more important than temporary results. What is your current direction? Are you moving toward your goals or away from them? Do you need to make a course correction? Are you enjoying life to the fullest? If not, make a change in one of these areas now. How many times have you heard the lament "Is that all there is?" The Apollo astronauts, who had prepared nearly their entire lives for their moon landing, were euphoric in their historic moment of glory, yet upon returning to earth some became terribly depressed. After all, what was left to look forward to? What could be a bigger goal than making it to the moon, exploring outer space? Perhaps the answer is to be found in exploring an equally uncharted frontier: the inner space of the mind and heart. We all need a continued sense of emotional and spiritual growth; it is the food on which our souls thrive. As you approach the attainment of the goals you've pursued, be sure to immediately design for yourself a new, compelling future. What is the ultimate goal? Perhaps it is aspiring to contribute something of value. Finding a way to help others -- those we care about deeply -- can inspire us for a lifetime. There is always a place in the world for those who are willing to give of their time, energy, capital, creativity, and commitment. What simple act of kindness could you show another person today? Decide now, take action, and be sure to appreciate how this makes you feel. Venerable comedian George Burns understands the importance of having something to look forward to. Summing up his life philosophy he said, "You have to have something to get you out of bed. I can't do anything in bed, anyway The most important thing is to have a point, a direction you're headed." Now in his nineties, he's still sharpening his wit, still taking on movie and TV projects, and booked himself for a performance at the London Palladium in the year 2000 -- when he'll be 104 years old! How's that for creating a compelling future? Most people overestimate what they can do in a year and underestimate what they can do in a decade. What will you be doing ten years from now? Think of something you enjoy or experience today that once was merely a goal. Many obstacles may have intervened in your pursuit of its attainment, yet now it's part of your life. As you follow your new dreams and encounter obstacles, remember: you've been through this before, and you've succeeded! The human spirit is truly unconquerable. The will to win -- the will to succeed, to shape one's life, to take control -- can be harnessed only when you decide what you want and believe that no challenge, no problem, no obstacle can keep you from it. Obstacles are merely a call to strengthen your resolve to achieve your worthwhile goals. Peter Guber Chairman of the Board and CEO, Sony Pictures Entertainment Robbins' Giant Steps is the ultimate game plan for life. It's an emotionally interactive primer for personal and professional success. Ken Blanchard best-selling author, One-Minute Manager series and Raving Fans With Giant Steps, I can now access Anthony Robbins' technology every day, feeling as if I have a ready-made coach at hand supporting and prompting me to stretch for the highest levels of creativity, leadership, and humanitarianism.